In my previous post for the Centre for Medieval Studies blog, I promised a much-needed follow-up to my interview with the storyteller Rachel Rose Reid, whose retelling of the medieval French Roman de Silence is currently touring around the country. This week, we’ll be talking about some of the more challenging questions raised by the text, and their impact on how she has interpreted the text and devised her own piece. Returning to your interpretation of Silence, I was struck by the way in which you begin Part 1 of the story. Why did you start your retelling of Silence by recounting your own story — that is, the story of how you came across this wonderful text? There were a couple of reasons: firstly, Heldris (the narrator-figure in Silence) doesn’t ‘start the story with the story’ either! Instead, we have this intriguing prologue that offers an invective against avarice. While I don’t begin my retelling in quite the same way, I do think that my own introduction serves a similar purpose — that is, to involve the audience in my storytelling, and to begin ‘weaving’, together with them, the world of the story. Immersion isn’t everything: whenever I come back to moments of honesty like this one, where I tell my own story, I’m being authentically present with the audience. There’s something in that interaction which means that people follow you: they trust you, and you’re able to ‘catch’ them if you feel that they need to be brought back into the story. … and, of course, Heldris does this throughout their own story, interacting — or at least presenting an interaction — with his own audience. There are points where he’s very direct about this: just before he reaches Silence’s birth, Heldris promises the audience (in the English translation) ‘a lively tale without any further fuss or ado’! … and this itself raises a fascinating question: why does the story (as Heldris tells it) start so far beforehand? Heldris could easily have started the story with the birth of Silence, but chooses not to: instead, there’s a focus on this question of inheritance, which makes up a large part of the first part of Silence. On a personal level, the inheritance question — which of course ‘sets up’ the motive for Silence to present as a different gender later in the story — is something that I’m very interested in. I’m part of a collective called Three Acres and a Cow, which has really opened my eyes to the different relationships that people have had to land over the centuries; it seems that, although we’re many generations down the line from the world of Silence, there’s still very much a legacy there, and the attitudes towards land and inheritance that Silence documents are still evident in the present day. A few years ago, I visited several Cornish towns with a story about suffrage, and people told us that their own aunts had missed out on inheritances for this same reason: it had gone to particular male relatives, in this case just before changes were made to inheritance law. I’m fascinated by the cultural landscape that informs tales such as Silence, by what it would mean to hear about changes to the law such as these; and by whether Evan’s actions would have been considered provocative or commonplace. Questions surrounding gender are more ‘front-and-centre’ in Part 2 of my retelling, of course, but the two ideas about inheritance and women are of course intimately connected. I’m interested in both questions: about who would have listened to this story, and how contentious the material about land ownership would have been. 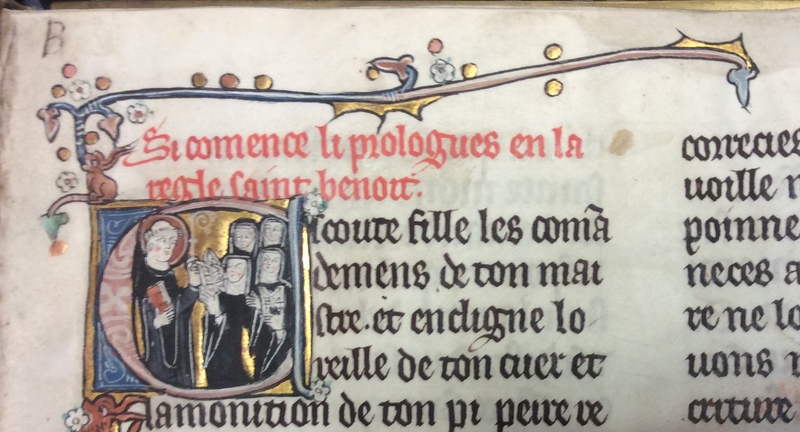 It’s been really satisfying to work with medievalists, including medievalists who aren’t necessarily familiar with the Roman de Silence itself, but who work on the general period during which it was produced. Even if the insights that come out of these conversations don’t make it into my retelling every night, it’s really fun talking to academics who can help to inform my telling of the story, answering some of the more esoteric questions. One question that’s intriguing me at the moment is that of what Cornwall would have meant to the audience of Silence: would it simply have been ‘somewhere far away’, or would it have had a more concrete opening? That’s a tricky question to answer, but there has increasingly been a tendency in research to stress the ‘connectedness’ of the medieval world, so it wouldn’t be unreasonable to expect the audience of Silence to be aware of Cornwall, at least in the context of a lot of the Arthurian material that locates Arthur in this area. 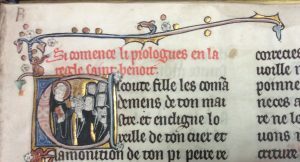 The very fact that the manuscript of Silence has survived in Britain at all is testament to cross-Channel movement: it is, after all, written in a dialect of French that shows relatively little Anglo-Norman influence, with far more of a Picard ‘feel’ to it. One theory suggests that the manuscript was composed around the late 13th century as part of a marriage dowry, only reaching England as a piece of plunder late in the Hundred Years’ War.1 Histories of manuscript provenance are, in the end, personal stories — much like the stories that you bring alive in your retelling. Rachel with Hayley Cotterill, Senior Archivist at the University of Nottingham, in front of the manuscript of the Roman de Silence. 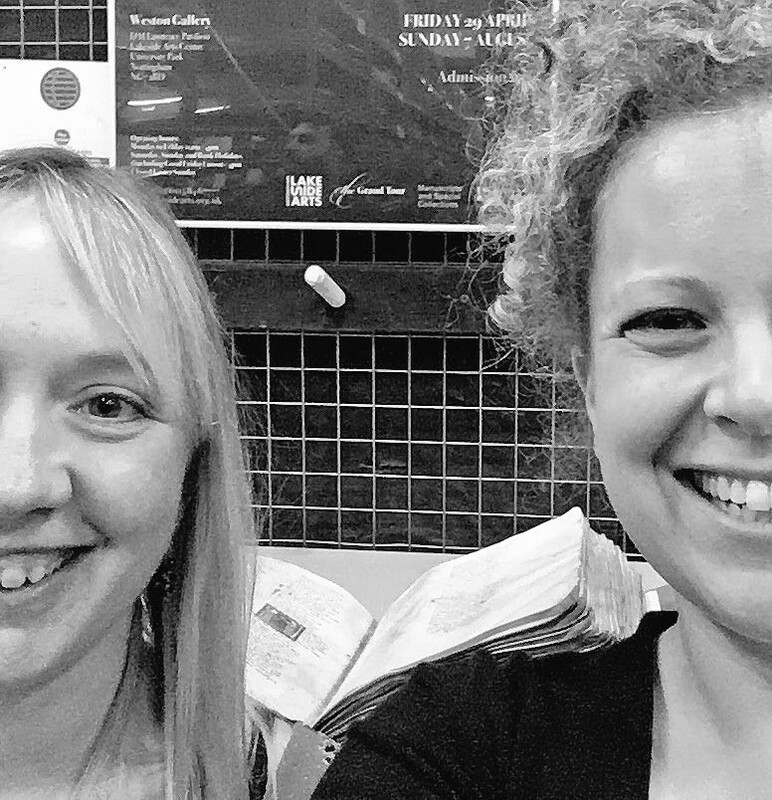 Working with Rachel has been an absolute privilege, and it’s been wonderful to re-acquaint myself with the Roman de Silence after a few years, particularly in the form of a retelling as lively, engaging, and powerful as hers. 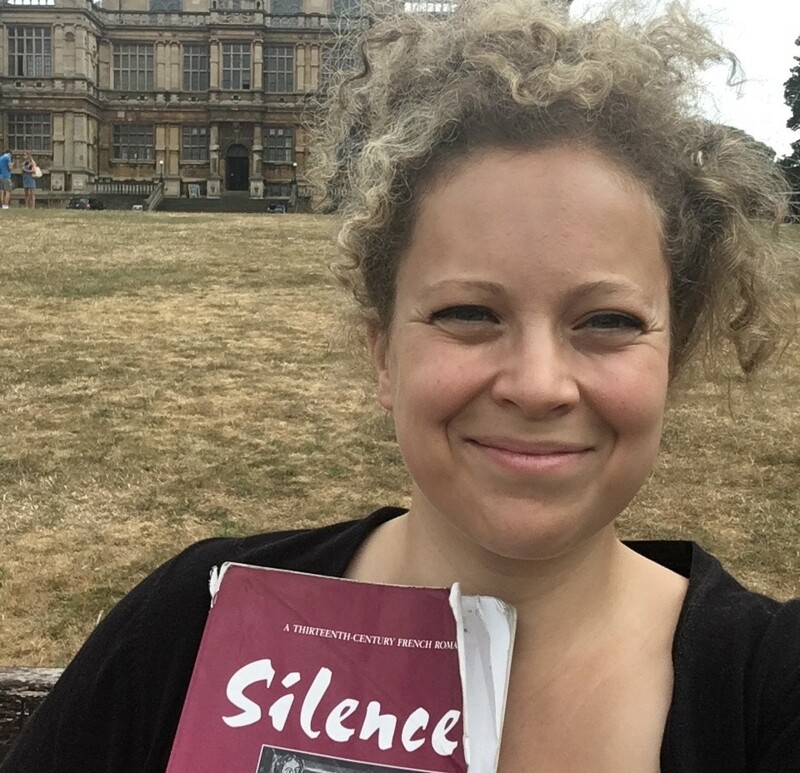 Rachel has transformed a story whose characters are often read as ciphers — ‘Silence’, ‘Euphemie’, ‘Eupheme’ — into an intensely human tale, while preserving its focus on questions that connect the medieval and the modern. For more information about Silence, see the show’s website. ; for more information, see silencespeaks.strikingly.com and rachelrosereid.com. If you’re reading this shortly after publication, and happen to live near either Amsterdam or Birmingham, Rachel will be bringing Silence to you on 3rd and 8th November respectively! 1 More recent work on the manuscript, however, has argued for an earlier dating of the early 13th century, based on an analysis of paratextual features such as illustration. See Alison Stones, ‘Two French Manuscripts: WLC/LM/6 and WLC/LM/7’, in Ralph Hanna and Thorlac Turville-Petre (eds. ), The Wollaton Medfieval Manuscripts: Texts, Owners and Readers (Woodbridge: Boydell and Brewer, 2010), pp. 41-56. 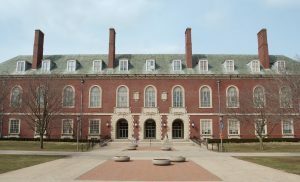 In the heart of the American Mid-West, two and a half hours from Chicago, in the University twin town of Urbana-Champaign is a rare gem of a collection of medieval manuscripts. Among them is a French translation of the Regula Benedicti, itself a relatively rare survival, particularly from such an early date (c. 1270), although vernacular versions of the rule were widely attested. The translation is also distinguished by an opening illumination (fo. 1ra) with an unusual depiction of Benedictine sisters gathered before the sainted father of the order and maker of the rule, clutching what would appear to represent their profession statements. Pasted on to the lower margin of Chapter 58, ‘On the manner of receiving sisters’, (fo. 25r), is an original profession statement, written out in a formal textura hand on a separate slip of parchment (now trimmed). The statement is in the name of one Claudia de Brilly, who identifies herself as making her profession of vows to become a sister of the abbey of St Sulpice and St Glossinde at Metz in the presence of Abbot Benedict of the abbey of St Arnould in the same city. The family of Brilly were lords of Touffreville and Villers-Bocage. This Benedict can be identified as Benoit Juville who held the abbacy of St Arnould between 1545 and 1566, defending the ancient abbey church even as the Emperor Charles V laid siege to Metz in 1552. Abbé Benoit was forced to lead his brethren to the relative safety of the city’s Dominican convent, although the Imperial siege ultimately proved unsuccessful. The sisters of St Glossinde, however, held firm and, for all the tensions outside, young Claudia’s early years under vows were uninterrupted. In several different ways the manuscript represents continuities in medieval monastic history: the remarkable resilience of female observance at Metz, which began in the 7th century and persisted until August 1792; the enduring role of Metz, once the crucible of the Gorze reform, as a monastic hub; and the survival of the ceremonial of profession, and the materiality of the rule within it, even as the boundaries, indeed the polities of the old European Christendom came apart at the seams.